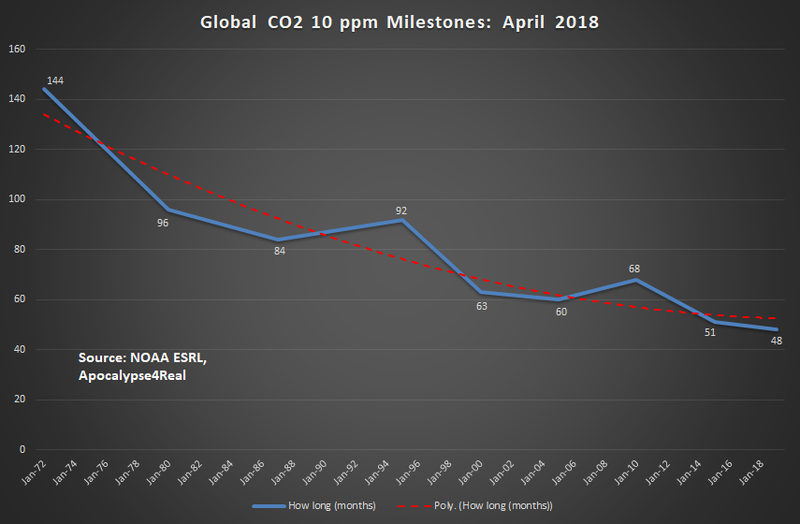 On July 5, NOAA ESRL published the preliminary April, 2018 global CO2 results. The world reached 408.96 ppm, up 2.63 ppm over April, 2017. This continues the monthly increases above 2 ppm for the fifth month, without a boost often associated with an El Nino. It continues the slow acceleration of atmospheric CO2 concentration buildup. While April 2017 to 2018 increase was 2.63 ppm, the five and ten year change in CO2 makes the accelerating trends more apparent. The 2018 concentration was 12.44 ppm above April 2013, and was the 26th month with an approximate 12 ppm increase. 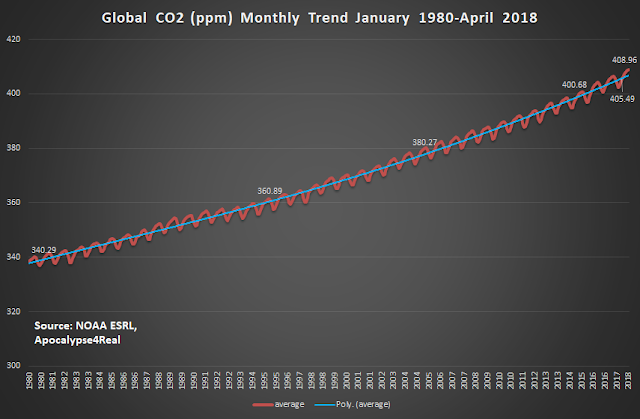 The change between 2018 and April 2008, was in increase of 22.67 ppm, supporting the slowly accelerating rate of increase of CO2 concentration. It is the 21st consecutive month with a 10 year change above 22 ppm. It is likely that April will be the peak global CO2 concentration for this year. However if trends hold, we are on track to exceed 410 ppm globally between February to April, 2019. That will be the first time in human history the planet will experience a 10 ppm change on CO2 concentration in 48 months - or perhaps less. This trend that takes us toward future climate disaster that we want to avoid. A continued increase of 10 ppm every 48 months places us on track to double preindustrial CO2 (280 ppm) by 2080. 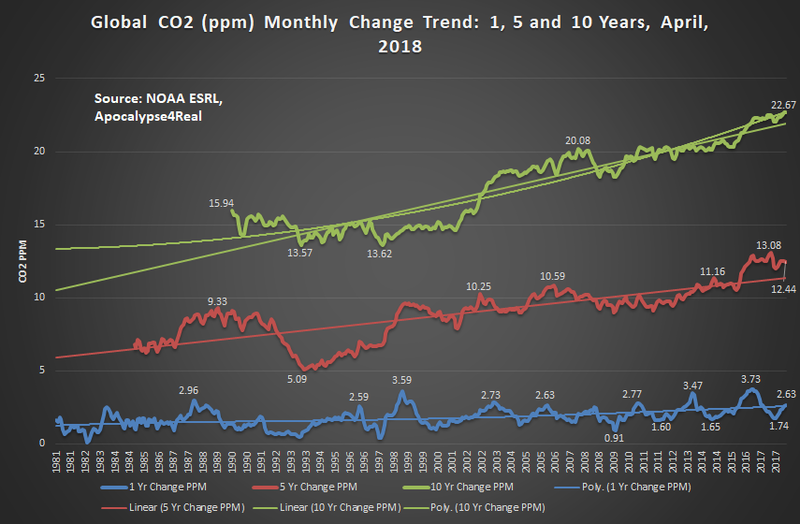 Further increases in emissions may put us on the path of adding 10 ppm every 36 months, which potentially shortens the time to doubling (560 ppm) into the 2060's.